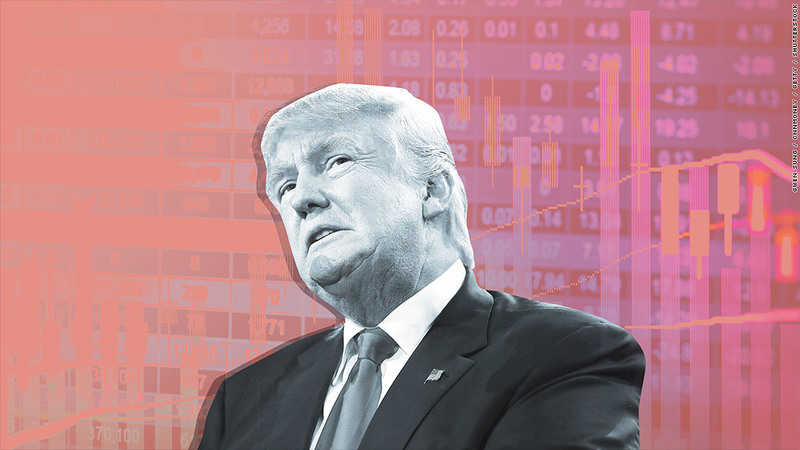 Wall Street is betting a Trump presidency and Republican-controlled Congress will be a recipe for more stock market gains over the next four years. All the major indexes are at or near all-time highs. Some companies will fare better than others. RBC chief U.S. market strategist Jonathan Golub wrote in a report Monday that there have already been big winners and losers during the post-Election Day rally. This trend could continue. "The best way to position portfolios for an all-Republican Washington is to focus on those investment characteristics poised to benefit most from pro-growth policies," Golub wrote. With that in mind, Golub put together a list of 40 companies that he thinks will benefit from Trump's potential policies -- which are likely to lead to a greater focus on domestic growth, lower corporate taxes and rising interest rates. The list -- which he calls a "Trumped-up portfolio" -- is dominated by banks, retailers and health care stocks. Troubled Wells Fargo (WFC) made the cut, as did PNC (PNC), Capital One (COF) and U.S. Bancorp (USB). Banks, especially ones that do more consumer banking than investment banking, benefit from higher rates since they can make more money from loans. Retailers could thrive if the overall economy heats up a bit and consumers have more money in their pockets due to lower taxes. Golub singles out Kohl's (KSS), Macy's (M), Bed Bath & Beyond (BBBY) and Best Buy (BBY) as potential winners. Health care is an area that could have hit the skids if Clinton won. She was promising to look closely into rising prices for key medications made by big pharmaceutical companies and biotechs. But Trump's win could lead to less regulatory scrutiny and an unwinding of some of the parts of the Affordable Care Act, or Obamacare. As such, Golub recommends drug distributors AmerisourceBergen (ABC) and Cardinal Health (CAH) as well as insurers Aetna (AET) and Anthem (ANTM). Only one tech company is on the list. And it's not a household name -- marketing services company Alliance Data Systems (ADS). Golub argues that now is the time to be looking at cheaper stocks that have been out of favor for the past few years. So that's why companies like Facebook (FB) and Amazon (AMZN) didn't make the cut. One media company made the list too -- but it's not a household name either. It's Tegna (TGNA), an owner of local TV stations that broke off from newspaper publisher Gannett (GCI) last year. Here are the other stocks that Golub thinks are worth a look. Energy and materials. The market is betting a Trump administration will favor the traditional oil sector over alternative energy. And commodity prices in general could rise. Golub singles out oil companies Southwestern Energy (SWN) and Tesoro (TSO) as well as gold and copper miner Freeport-McMoRan (FCX). Transportation. Another potential winner from an infrastructure and energy boom? Companies that haul stuff (and people) across the country. Golub lists airlines Alaska Air (ALK) and Southwest (LUV), logistics firm Ryder (R), railroad Norfolk Southern (NSC) and equipment rental company United Rentals (URI) as picks in this sector. Best of the rest. Two other health care stocks -- drug distributor McKesson (MCK) and pharmacy benefits management firm Express Scripts (ESRX) made Golub's list. Golub really likes financials. Fourteen of the 40 companies on his list are from this sector. Like the banks highlighted above, the other financial companies he chose all cater more to consumers than Wall Street. He picks student loan company Navient (NAVI), regional banks BB&T (BBT), Regions (RF), Huntington (HBAN) and Zions (ZION), insurers Lincoln National (LNC) and Unum (UNM), asset managers Legg Mason (LM) and Ameriprise (AMP) and credit card company Discover (DFS). Golub is also making a clear bet that consumers will spend more. Six other retailers made it into his portfolio -- Staples (SPLS), Gap (GPS), Urban Outfitters (URBN), Nordstrom (JWN), AutoNation (AN) and CarMax (KMX). It is interesting that none of the stocks in this portfolio are in the Dow 30. Golub is indicating that he expects investors are going to turn inward, like Trump. The focus will be more on companies that generate a big chunk of their sales and profits from the U.S.
And that seems to be one of the main reasons why the Russell 2000, an index of smaller companies that tend to have less international exposure, is also at an all-time high.